Our crafty friends of the Cartoonist Conspiracy Anna Petosky and Julie Cannon (along with a number of other friends of theirs) have started The International Craft Conspiracy, where you can go to jam on quilts, build a macrame tarantula, design a dress out of phone books, or learn how to knit a cozy for your bong… and you can meet other similarly craft-enthused people to share your projects and passions with. You can find out more information about them on their website. 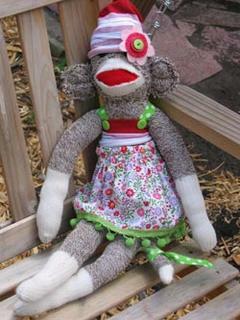 Photo: The loveliest sock monkey you ever saw, by Julie Cannon.